In the past few years, the previously monolithic and stable political panorama of Latin America, marked by restrained competition between two models — conditionally left and right — but in general stable since the mid-2000s until the mid-2010s, has been subject to centrifugal tendencies. First, the countries of the “left turn”, after a relatively long period of sustained leftist governance and political continuity, saw progressive governments in Argentina and Brazil replaced. The ‘civil revolution’ in Ecuador finds itself in times of uncertainty after Lenin Moreno assumed office in 2017, not meeting the expectations of his predecessor, Rafael Correa, for the continuity of his policies. The resignation of the President of Peru, Pedro Pablo Kuczynski, in March 2018 was the first case of this trend of instability affecting the right-wing governments of the region. The presidency of Kuczynski can be generally assessed as unsuccessful. Despite pre-election promises to support democracy and protect human rights, the criminalization of social protest, including at the legislative level, only intensified in the years of his presidency. The hopes for positive changes in the country are associated with Martín Vizcarra, who succeed Kuczynski as head of state. Real anti-corruption measures, providing for, among other things, the independence of the judiciary, are heavily expected from him. In the past few years, the previously monolithic political panorama of Latin America, marked by restrained competition between the two models — conditionally left and right — but generally stable since the mid-2000s until the mid-2010s, has been subject to centrifugal tendencies. First, consider the countries of the “left turn”: Argentina (under spouses Nestor Kirchner and Cristina Fernandez from 2003-2015), Bolivia (under Evo Morales since 2006), Ecuador (under Rafael Correa from 2007–2017), Nicaragua (under Daniel Ortega since 2007), Uruguay (under either José Mujica or Tabaré Vázquez since 2005) and Venezuela (under Hugo Chávez from 1999-2013). After this relatively long period of sustained leftist governance and political continuity,progressive governments were replaced Argentina — with the defeat of kirchnerist Daniel Scioli in the 2015 elections — and Brazil — with the 2016 impeachment of Dilma Rousseff.. The ‘civil revolution’ in Ecuador finds itself in times of uncertainty after Lenin Moreno took office in 2017, not meeting the expecations of his predecessor, Correa, for the continuity of his course on a number of issues. The resignation of the President of Peru, Pedro Pablo Kuczynski, in March 2018, only a year and seven months after he took office, was the first case of this trend of instability affecting the right-wing governments of the region. Peru is clearly a special case in the Latin American trend of the “left turn”. This trend, represented by a number of left-wing governments (Argentina, Bolivia, Brazil, Venezuela, Nicaragua, Uruguay, Ecuador, etc.) predetermined the political and economic course of the region for more than a decade since the 2000s. Peru joined this trend rather late with the election of retired military officer Ollanta Humala — the leader of the Peruvian nationalist party (Partido Nacionalista Peruano, PNP), — as president in 2011. When Humala first participated in presidential elections in 2006, he positioned himself as an adherent of “21st century socialism” and friendly to Chávez and Fidel Castro. His victory in the presidential race in 2011 over Keiko Fujimori – the daughter of former President Alberto Fujimori (1990–2000), who was serving a 25-year prison sentence for corruption and violations of human rights – formally marked the continued expansion of left-wing ideology in the region. Despite this, under Humala’s presidency, Peru was practically never mentioned as a participant in the Latin American “left turn “. There were no key features in his policy that aligned with left-oriented government — both radical and moderate — in the region: aggressive anti-American rhetoric (to some extent), rapprochement with the Bolivarian Alliance for the Peoples of Our America (Alianza Bolivariana para los Pueblos de Nuestra América, ALBA), measures for increasing state control of the economy, etc. Humala’s election should be considered in line with the following factors. First, given the social transformations due to poverty, which reached 60% in the Indian regions, and the country’s extreme dependence on foreign capital, leftist ideas in Peru were largely discredited as a result of the long-lasting internal armed conflict of 1980–2000 between the state, the Maoist guerrilla army Shining Path (Partido Comunista del Perú – Sendero Luminoso, PCP-SL) and the Tupac Amaru Revolutionary Movement (Movimiento Revolucionario Túpac Amaru, MRTA), killing about 70 thousand people. The second most important factor is the crisis of the party system in Peru. After the fall of Alberto Fujimori’s neo-liberal regime, the country virtually had no political forces on the national scale, with the exception of the Peruvian Aprista Party (Partido Aprista Peruano, PAP). Even presidential candidates were often not known to the majority of Peruvians and were not sponsored by well-known parties, which increased the likelihood of obscure individuals coming to power. Humala was a former army officer, and the ideological foundation of his party was based on anti-imperialism, post-neoliberalism, and the doctrine of “Andean-Amazon socialism” by Jose Carlos Mariategui, the founder of the Peruvian Communist Party (Partido Comunista Peruano, PCP). The president’s father, Isaac Humala, is a representative of the Quechua people, a follower of “ethnocacerist” ideology, based on extreme nationalism and the cult of the Inca Empire (Tawantinsuyu). In 2000, Humala together with his brother Antauro led a failed military coup against Fujimori, and in 2006 he took part in the presidential elections, losing in the second round to Alan Garcia from PAP. In the 2011 elections, Humala represented the “Peru Wins” coalition (Gana Perú, GP), which, in addition to the PNP, included traditional leftist parties: the PCP, Socialist Party (PS), Revolutionary Socialist Party (PSR), etc. The coalition was supported by numerous regional movements, the Confederation of Peruvian Workers (CTP), and part of the peasantry. Having won the election, however, Humala distanced himself from left ideology and during his mandate actually followed neoliberal economic policy, which earned him accusations of “betrayal“. Under Humala, the pace of economic growth in 2012-2015 amounted to an average of more than 4.5% per annum (2011 — 6.5%, 2012 — 6%, 2013 – 5.8%, 2014 — 2.4%, 2015 — 3.2%), which gave rise to talks about the “Peruvian economic miracle”, as well as the reduction of poverty in rural areas. Despite this, the president’s approval ratings fell to 11% by the end of 2015, which was explained by the economic slowdown caused by the fall in world commodity prices, the negative social and environmental consequences of unlimited access of foreign capital to natural resources, and the weakness of state institutions. Humala’s Peruvian model of an open economy, serving as an example of a counterweight to the leftist governments of the region a few years ago, demonstrated vulnerability to external factors. Suffice it to say that his political party — which survived the crisis — did not even nominate a candidate for the 2016 presidential election. One of the main features of the Latin American “left turn” is the foreign policy of the states affected by this trend, which became more independent from the US- supported by the commodities boom of the 2000s to early 2014 – and closer to extra-regional actors (China, Russia, and Iran). The second important feature was the intensification of regional integration processes within such organizations as the Union of South American Nations (Unión de Naciones Suramericanas, UNASUR), the Common Market of the South (Mercado Común del Sur, Mercosur), the Community of Latin American and Caribbean States (Comunidad de Estados Latinoamericanos y Caribeños, CELAC), and left radical block ALBA. Peruvian foreign policy in the time of Humala’s presidency significantly differed from the left-oriented states of Latin America. The country did not converge with ALBA, but together with the other “right” states of the region — Mexico, Colombia, and Chile — joined the Pacific Alliance (Alianza del Pacífico, AP) that was created in 2011 and based on the principles of the free market, as opposed to the protectionist MERCOSUR. In addition, unlike Venezuela, Ecuador, Bolivia, Argentina, and Brazil, which experienced crises in their relations with the United States, Humala’s Peru maintained close ties with Washington, including in the military sphere. This, however, did not prevent the Peruvian government from successfully developing its relations with Russia: in 2013 the countries signed a contract for the purchase of 24 Russian Mi-171Sh helicopters for the Peruvian Armed Forces, and progress was achieved in cooperation in the sphere of space exploration. The results of the general elections in Peru on April 10, 2016 — the right-wing party “Fuerza Popular”(FP) winning the absolute majority in thecongress, and two right-wing candidates, the FP’s Keiko Fujimori from FP and the right-centrist Kuczynski, entering the runoff, where the latter eventually won with 50.12% of the votes against the former’s 49.87% — along with the defeat of kirchnerists in Argentina (November 2015) and chavists in Venezuela (December 2015), gave rise to talk of Latin America “turning right”. Then, in the face of the second round, the country actually split into supporters of Fujimorism and anti-Fujimorism, which was good for Kuczynski as regardless of ideological preferences, those who opposed the Fujimoris returning to power, voted for him instead. In addition, the left Broad Front (Frente Amplio, FA), whose candidate Verónika Mendoza got 18.2% of votes in the first round, backed Kuczynski in the second round, which was another factor in his victory. The unicameral congress consisting of 130 deputies was distributed as follows: 73 for the FP, 18 for the PPK, 20 for the FA, and 5-9 seats each for three other parties. The presidency of Kuczynski can be generally assessed as unsuccessful. Experts note that, despite pre-election promises to support democracy and protect human rights, the criminalization of social protest, including at the legislative level, only intensified in the years of his presidency. Of the 176 social conflicts of varying intensity and scale recorded in Peru as of January 2018, two-thirds were environmental, most of which were related to the mining industry. In mid-December 2017, the opposition-controlled parliament supported the initiative to begin impeachment proceedings for President Kuczynski due to “moral inability” to hold the post of head of state, in connection with the information that some companies affiliated to the President received USD 4.8 million from the Brazilian construction firm Odebrecht between 2004–2013. At the time, Kuczynski was first Minister of Economy and Finance (2001–2002, 2004–2005) and then President of the Council of Ministers of the Government of Peru (2005–2006). By the beginning of the impeachment process, high-ranking officialsfrom Mexico, Colombia, Venezuela, Argentina, Ecuador and other countries in the region had already been implicated in the Odebrecht case, which had become the largest corruption scandal in Latin America. However, impeachment was not approved in the decisive vote that took place in the Congress on December 21, 2017. Just a few days after that, Kuczynski pardoned former president and autocrat Alberto Fujimori. This decision caused many thousands to protest in the street, and several MPs from PPK, as well as three ministers — of culture, defense, and agriculture — to resign in dissent. In March 2018, new proceedings werre initiated against Kuczynski, this time in connection with new evidence of corruption, which threatened to turn into impeachment for the President. In this situation, Kuczynski decided to resign. According to the constitution, First Vice-President Martín Vizcarra took the post of head of state until the end of the mandate (July 2021). One of the first states to express support for the new president was China, as Beijing is interested in expanding bilateral cooperation. At the moment, the Asian giant is Peru’s main trading partner; Chinese investments in this country amount to USD 14 billion. Experts and politicians assess differently the role of Vizcarra in resolving the corruption crisis. For example, the leader of the “New Peru” movement (Nuevo Perú, NP) and candidate for the 2016 elections, Veronika Mendoza, urged the President to convene new elections — excluding politicians implicated in the current crisis — thus renewing the Peruvian political class. However, the hopes for positive changes rest directly with Vizcarra. Real anti-corruption measures, providing for, among other things, the independence of the judiciary, are heavily expected from him. During the inauguration ceremony, he explicitly noted the fight against corruptionas the key task for his government. 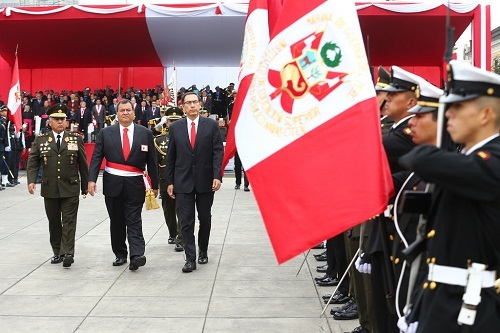 Unsurprisingly, demand for tackling corruption is high in Peruvian society: aside from Kuczynski, the Odebrecht corruption scandal involved another three former presidents: Alejandro Toledo (2001–2006), Garcia (2006–2011) and Humala (2011–2016). Academic Editor of Latin America Journal, RIAC expert.